ShopCalc is a calculator specifically designed for the handyman, woodworker or D.I.Y. enthusiast. With ShopCalc you enter and work with feet, inches and millimeters. Add, subtract, multiply and divide your measurements without worrying about converting them to another format. If you work in inches then do your calculations in inches. 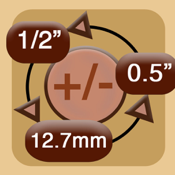 The Fraction buttons make it quick and easy to input fractional inches. 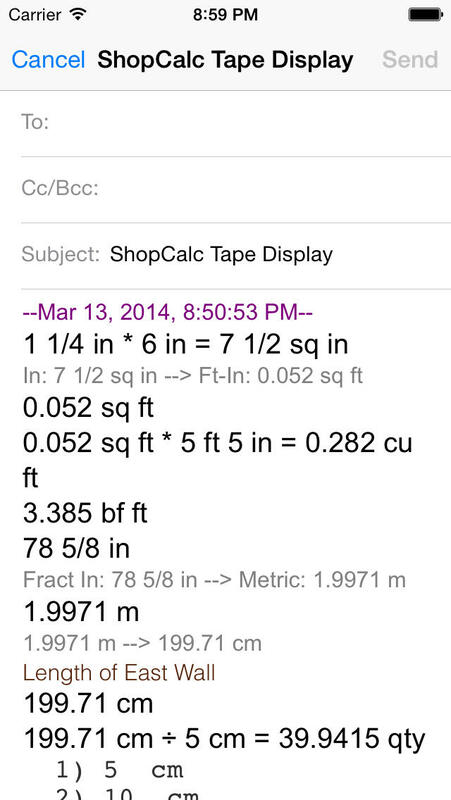 All your calculations are recorded to ShopCalc's HTML tape display. You can add your own notes and email the tape. Great for recording measurements or tracking your work. Since you can change units at anytime ShopCalc is also a handy Metric/SAE converter, inches to feet converter, or fractional to decimal inches converter. • "Trace Increments": - this feature prints the values needed to divide a board and makes laying out the cuts on a board a snap. • Kerf - You can specify the kerf created by your saw and this value will be factored in when dividing a board.